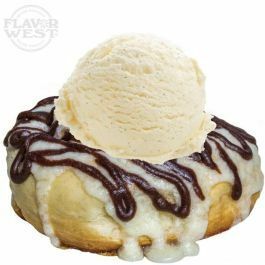 Ever had a Cinnamon Roll drizzled with milk chocolate and a hint of Vanilla? If no, you'll want to try this perfectly mixed flavor. It gives you a yummy taste in dessert, baked treats and more. Type: Reindeer Poop Water Soluble Flavoring. Ingredients: Natural and Artificial Flavoring, Propylene Glycol and Ethanol. USP Kosher Grade Flavoring. Usage Rate: 15-20% for E-use. Flavor Suitability: Suitable for desserts, ice creams, pastries, candy, lip balm and more. Specific Gravity: 1.03 No Refunds on Flavoring. I would say this is a good flavor if you're looking for something that taste like a cinnabon. Mostly needs some cream to add some sweetness. I used this at 12% for my first try with nothing else and it came out after an hour in an ultrasonic bath and a 8 or so hours of sitting. May have other flavor notes to it but all I get is that cinnabon taste for the moment. Hope this helps some one, good luck.